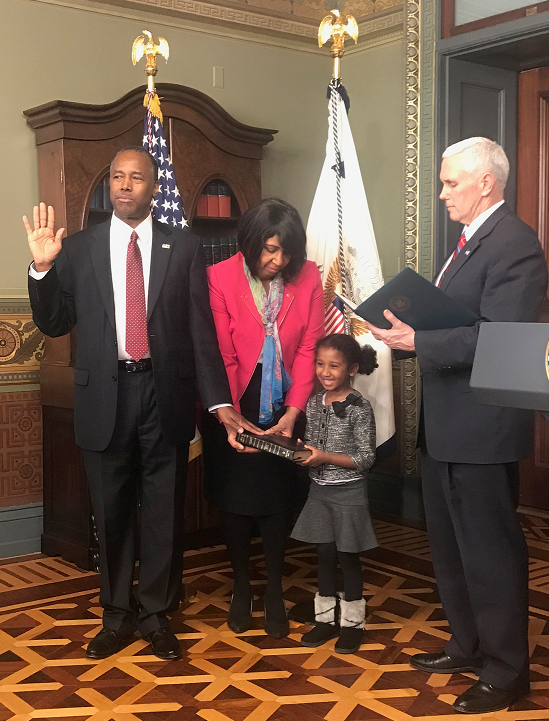 WASHINGTON – Dr. Ben S. Carson, Sr. was sworn in today as the 17th Secretary of the U.S. Department of Housing and Urban Development (HUD). Vice President Mike Pence administered the oath of office with Secretary Carson's wife Candy and granddaughter Tesora holding the bible. Secretary Carson will now lead a cabinet agency with approximately 8,000 employees and an annual budget totaling more than $40 billion. "I am immensely grateful and deeply humbled to take on such an important role in service to the American people," said Secretary Carson. "Working directly with patients and their families for many years taught me that there is a deep relationship between health and housing. I learned that it's difficult for a child to realize their dreams if he or she doesn't have a proper place to live, and I've seen firsthand how poor housing conditions can rob a person of their potential. I am excited to roll up my sleeves and to get to work." For nearly 30 years, Secretary Carson served as Director of Pediatric Neurosurgery at the Johns Hopkins Children's Center, a position he assumed when he was just 33 years old, making him the youngest major division director in the hospital's history. Dr. Carson received dozens of honors and awards in recognition of his achievements including the Presidential Medal of Freedom, the nation's highest civilian honor. He is also a recipient of the Spingarn Medal, which is the highest honor bestowed by the National Association for the Advancement of Colored People (NAACP).